office mum: Good day, good parent? I worry a lot that I'm not very good at being a parent. I work outside the home because financially I have to, as many mothers do. I also enjoy my job, and wonder sometimes if it's easy to hide behind the financial obligation - how would I really feel if suddenly it was possible to pay the mortgage with just one income? I think I would be thrilled and petrified in equal measure. When I'm off on Fridays, I have many, many moments that end with a silent "why?" Why do they squabble so much? Why, in spite of being certain that today I would not get cross, did I end up shouting? Why am I taking time off work - unpaid time off - to shout at my children? And I worry that I'm just not cut out for being a stay at home mum. Not a nice feeling. But for every "why?" moment, there are many happy, smiley, funny and fun moments. And for every disastrous day there are many good days, where it just all flows. Today was like that - we had a perfect day. Obviously, as there were three small children involved, by perfect I just mean that there were more good bits than bad. The toddler hitting a little girl not once but twice wasn't a great moment. None of the kids ate their dinner ("thank you for making a dinner mum but it's too yuck" - at least they were polite). Nobody had an argument before, during or about breakfast. Emmie spilt milk all over the table and the floor but I didn't get cross. 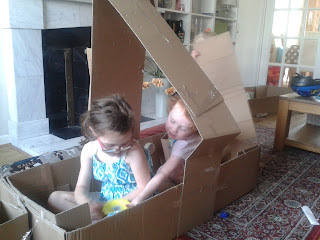 The girls made a rocket-turned-sailboat out of a giant cardboard box - it took about four hours to make, they were completely caught up in it and best of all, they didn't need any help from me. I can take absolutely no credit for it, but the fact that they made it made me feel like a good mother. 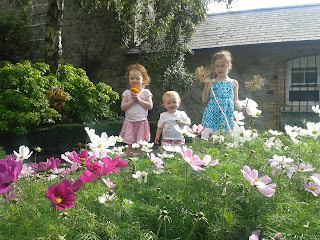 We nearly went to the library - the girls wanted to see their local library which has been recently refurbished, but half way there the rain stopped and the sun came out so we deviated to the park instead. But if we had gone, I'm sure it would have been good. And a good parent thing to do. 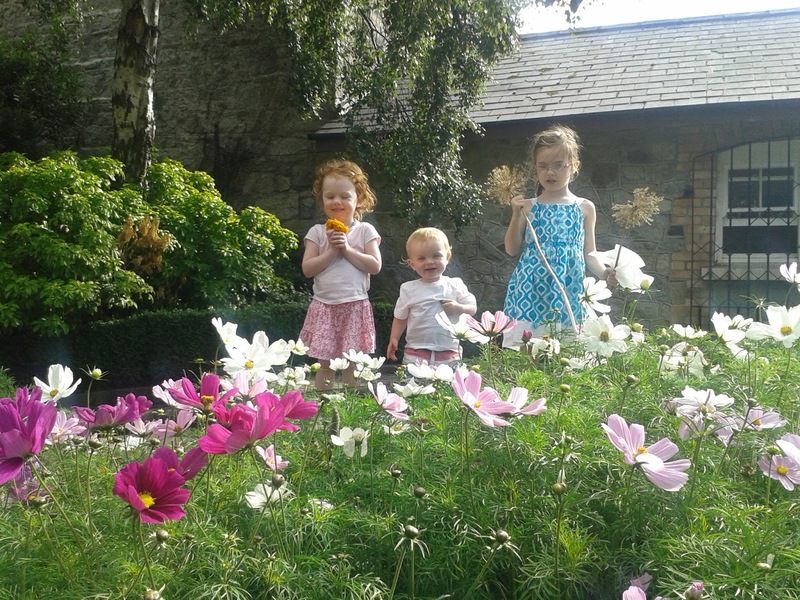 So instead we went for coffee, sitting in the sun in the gorgeous little Japanese garden in Cabinteely Park and the kids told me I was the best mum ever for getting them ice-cream. I totally know that doesn't make me a good mother, but still. 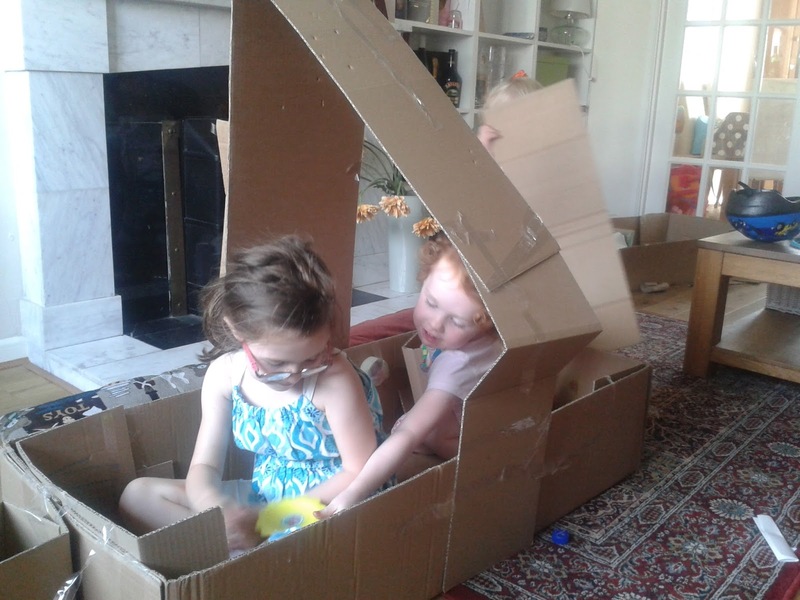 Afterwards they ran around the park, looking for secret doors in the trees which might indicate that fairies and pixies live in them (The Faraway Tree is their current bedtime story). It felt very freeing to let them run without worrying about traffic, shops, getting lost, being hit by a swing, being kidnapped or hitting other small children. I read this week that anger erupts when something doesn't go as planned, and I had that in mind today - watching out for warning signs, scanning for anything that might not go according to expectations, so that I could preempt it with a calm(ish) reaction. And I think it worked, at least a little. I'd like to think that if I was doing this all the time, being a stay-at-home-mum, we'd find a routine. I'd be better equipped to see what's coming and to deal with deviations from the plan. And therefore avoid the red-rag moments and angry outbursts. Or maybe today was just one of those great days that come around every now and then. Perhaps I shouldn't overthink it.